With his hyper-stylised approach to filmmaking and curt, dismissive approach to seemingly everything else, Nicolas Winding Refn is a man who really couldn’t help but acquire an avid cult following. That said, up until 2012, his career was characterised primarily by the maddening sense of great potential being left untapped: Pusher, Valhalla Rising and Bronson all effectively advertised his eye for alluring visuals and talent for visceral ultra-violence but none of them fully came together as films. While this year’s disappointingly self-indulgent Only God Forgives suggests that Refn has returned to old habits in a way that leaves the true extent of his talent as a filmmaker as questionable as ever, last year brought about the movie that would instantaneously fire itself and its helmer into the highest ranks of cult phenomenon, to stand alongside Big Lebowskis and Donnie Darkos forevermore. 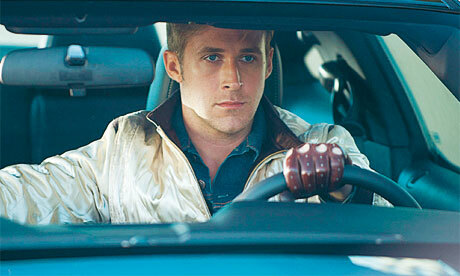 That movie was Drive. The plot is pretty standard Hollywood fare: a mysterious young man falls for the girl next door, tries to use his talent as a wheelman to help out her and her young son, and quickly finds himself in a desperate struggle to protect them from the local mob boss after a seemingly simple heist goes badly wrong. Under many directors, that storyline could easily become a Fast & Furious-style, testosterone-fuelled exercise in mindless excess. This is a neon-drenched piece of neo-noir, an electro-infused Taxi Driver, a slickly minimalist thriller, a postmodern fairytale and, above all, a ninety-three minute masterclass in style. One of the film’s greatest strengths is the confidence it carries itself with. Legendary filmmaker Hayao Miyazaki once spoke about the cinematic importance of the Japanese term ‘ma’. Roughly translated, it means ’emptiness’; in film, it refers to the quiet moments in between those filled with action and emotion. Whilst the Michael Bay school of cinema demands a neverending stream of explosions, gags and leering chest-shots to scream for the viewer’s attention at every turn, Refn’s faith in his work and his audience allows him to move at his own pace. He knows that his movie oozes style; that every frame is so meticulously composed and perfectly complemented by Cliff Martinez’s ethereal electronic score that he can afford to dwell, to draw you into the film’s quiet moments before blowing you away with its loud ones. Few films create the same degree of exhilaration emptying entire clips that Refn manages with Drive’s single nerve-shattering report. It’s possibly this patience that allows Drive to get away with its more exuberant tendencies because, in many ways, it’s a film that absolutely should not work. Take the opening credits: a shot of the illuminated LA cityscape with the film’s title emblazoned across it in hot pink cursive as Kavinsky’s Nightcall blares and we slowly cut to our satin-jacketed hero stare wistfully into the middle distance before driving off into the night. What should be ridiculous is instead made impossibly, ineffably cool, partially because of what preceded it: a near-silent, car-bound game of cat-and-mouse with the police that slowly cranks the tension up to bursting point before finally exploding into the aforementioned musical queue. Again, the quiet moments earn the loud ones.